This "English Grammar Test" app is designed to help you improve your English Grammar ability. 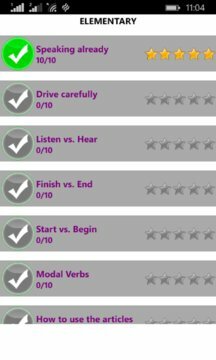 With more than 15000 English quiz including every aspect of English grammar, this app is very useful for every English learner to get English Grammar skill better. Currently we have 15000+ questions divided into 3 main level: Elementary, Intermediate, Advanced. Each main level includes hundreds of sub-level to let you test easily.